Eight months ago on September 25, 2015, the United Nations General Assembly adopted resolution A/Res/70/1 which deals with the development agenda for a 15-year period. It means that come September 2016 Guyana will have 14 years in which to achieve the goals set out in the resolution aforementioned. The resolution in reference deals with the world attempting to achieve sustainable development goals (SDGs) by 2030. The SDGs consist of 17 objectives and 169 targets that the international community feels must be achieved if the world is to be without poverty by 2030 and for its inhabitants to live in peace and share in global prosperity. It is a tall order since poverty and war are not caused by any specific issue which could prevent them from happening. However, since man lives in hope, there is the belief that all things are possible and some solution might be found to make it possible to eliminate poverty and the seeds of war. This article will identify the sustainable development goals and briefly explain their purposes. Next week’s articles will discuss the implications of these goals for the domestic production, finance and knowledge structures and what the international community expects to happen to the people who depend on these structures. The SDGs could be viewed as the world’s way of sustaining its collective effort at fighting for a better quality of life for all its inhabitants. This latest effort has its genesis in the declaration of 2000 where world leaders committed themselves to working towards achieving the eight Millennium Development Goals (MDGs) by 2015. The year 2015 has come and gone and more than one billion people have been taken out of extreme poverty. But there is still much to be done for humans to feel satisfied with the condition of the fellow members of their species. As such, many countries could be satisfied with the progress that they made towards reducing poverty and hunger in the world. The progress made under the MDGs therefore was heartening and it served as an encouragement to believe that the goals, initially set under the MDGs, could be achieved if a committed effort continued. The adoption of the SDGs is recognition of the fact that the success achieved under the MDGs was insufficient to make one feel contented and to relax the effort of extinguishing poverty, the scourge of mankind. As a consequence, it appeared necessary to continue the work which began under the millennium challenge. World leaders therefore see the work that they have agreed to in Resolution 70/1 as a means of building on the efforts under the Millennium Development Goals and as a way to complete the unfinished business. The goals are straightforward and speak to us in a direct manner. What then are the world leaders trying to build? The first of the 17 goals is to end poverty in all its forms in all countries of the world. It is a tall order but political will and commitment could make it happen. The second goal is to end hunger, achieve food security, improve nutrition and achieve sustainable agriculture. This hydra-headed goal is appealing to the conscience of mankind. No human being that survives childbirth should be left to punish. But that is the fate of an undernourished child. Such a person often grows up stunted and, in many cases, without the ability to realize his or her maximum potential. Such a child was likely to drop out of school early and commence or continue a cycle of poverty or engage in a life of crime. The third goal is to ensure healthy lives and promote well-being for all at all ages. One can see the connection between access to food and health in the form of nutrition. But clearly the third goal goes beyond that concern. It is also about access to good health care. It means access to good doctors and nurses. It means access to needed drugs, surgery, and other aspects of healing that might be required to prolong a useful life. The fourth goal acknowledges something that Guyanese have known a long time ago. We must ensure inclusive and equitable education for all and promote lifelong learning opportunities for everyone. We understand by this that one never stops learning. We also understand that education does not only occur in the classroom. It occurs in all phases and aspects of life. 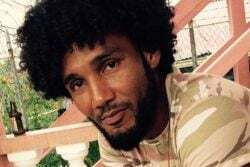 It takes place in the workplace and in third places like restaurants, parks and other spots for liming. The fifth goal is to achieve gender equality and empower all women and girls. The education that we get from life’s experience ought to place us in good stead to respond favourably to the goal of equality and empowerment. Yet, it might prove a difficult goal to achieve, if only because of the competition that has developed between men and women. The sixth goal is to ensure availability and sustainable management of water and sanitation for all. The seventh goal is to ensure access to affordable, reliable, sustainable and modern energy for all. Most production processes require some amount of energy. To the extent that energy is expensive or unavailable in competitive quantities, a country can suffer severely. That is where Guyana is at the moment, even though that situation could change if the oil discovery reaches the stage of production. The eighth goal is to promote sustained, inclusive and sustainable economic growth, full and productive employment and decent work for all. This latter goal is rich with potential for enabling people to get out of poverty and for creating the scope for self-reliance. It therefore gives people a chance to provide for themselves and the opportunity to live in dignity. The ninth goal is to build resilient infrastructure, promote inclusive and sustainable industrialization and foster innovation. The tenth goal is to reduce inequality within and among countries. The eleventh goal is to make cities and human settlements inclusive, safe, resilient and sustainable. It is about access to adequate, safe and affordable houses. The idea is to see how fast countries can do away with slums and create decent housing for its people. The smart city and human settlement concept also calls for action in areas such as transportation and waste management. The twelfth goal is to ensure sustainable production and consumption patterns. There must be sustainable use of natural resources. An important point here too is the need to reduce the amount of food that is wasted. As a result of various social programmes, the world knows that plenty food is wasted on a daily basis. Some social programmes try to capture that waste and convert it into consumable items for the deprived and starving. The thirteenth goal is to take urgent action to combat climate change and its impact on the world. A major focus of this goal is the United Nations Framework Convention on Climate Change (UNFCCC). This is the principal inter-governmental forum for discussing and negotiating the global response to climate change. The fourteenth goal is to conserve and sustainably use the oceans, seas and marine resources for sustainable development. The common resources are seen as important to the survival and the achievement of a good quality of life for the people of this planet. The fifteenth goal is to protect, restore and promote sustainable use of terrestrial ecosystems, sustainably manage forests, combat desertification, and halt and reverse land degradation and halt biodiversity loss. The sixteenth goal is to promote peaceful and inclusive societies for sustainable development, provide access to justice for all and build effective, accountable and inclusive institutions at all levels. The seventeenth goal is to strengthen the means of implementation and revitalize the global partnership for sustainable development. Concerns about public institutions and how ineffective they have been in many countries of the world have surfaced. Many experts view the failure of public institutions to regulate and monitor public resources as one of the most important reasons the development of some resource-rich countries has been uneven. Each of the 17 goals could be pursued in its own right with possible positive effects for the other goals. Yet, they can be integrated and balanced with the three dimensions of sustainable development: the economic, social and environmental. There are strong interlinkages between existing UN initiatives to address aspects of the SDGs. One of those is the International Decade for People of African Descent (IDPAD). The period for the implementation of the SDGs encapsulates that of the implementation of the programme of action for achieving the goals of the IDPAD which means that the two could be integrated and implemented together. 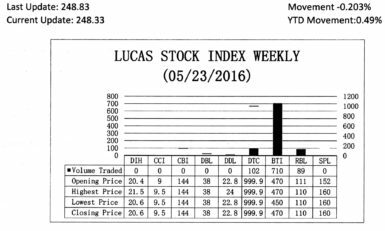 The Lucas Stock Index (LSI) declined 0.203 per cent during the fourth period of trading in May 2016. 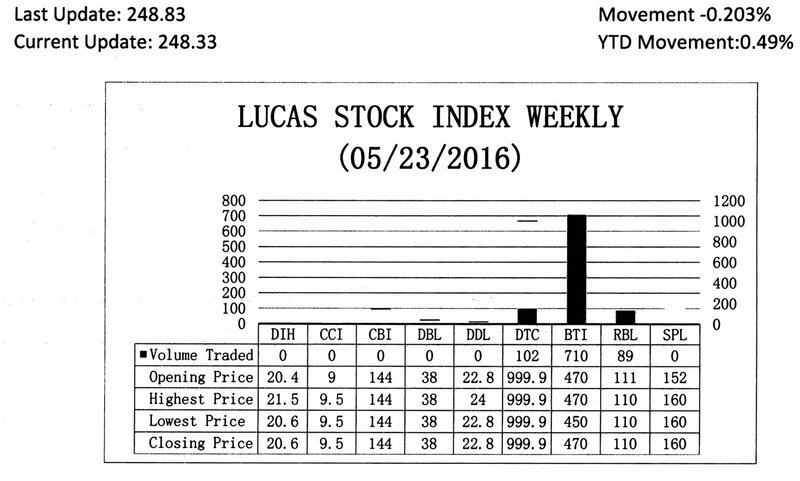 The stocks of three companies were traded with 901 shares changing hands. There were no Climbers and one Tumbler. The stocks of Republic Bank Limited (RBL) fell 0.90 per cent on the sale of 89 shares. In the meanwhile, the stocks of Demerara Tobacco Company (DTC) and Guyana Bank for Trade and Industry (BTI) remained unchanged on the sale of 102 and 710 shares respectively.